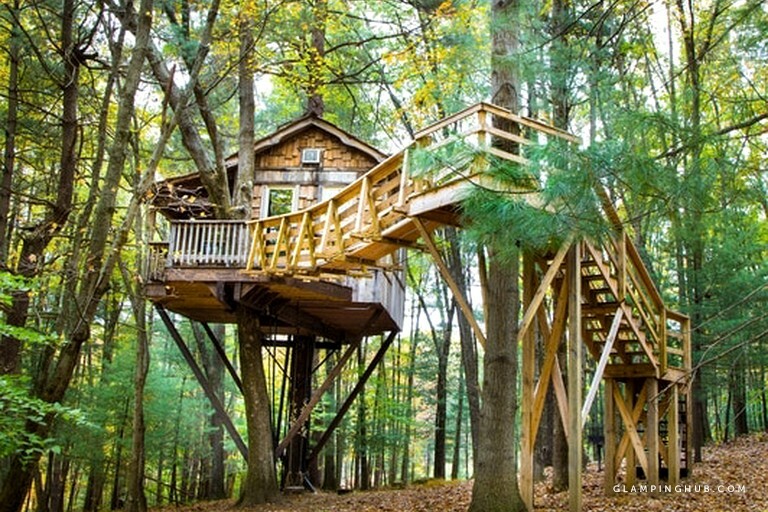 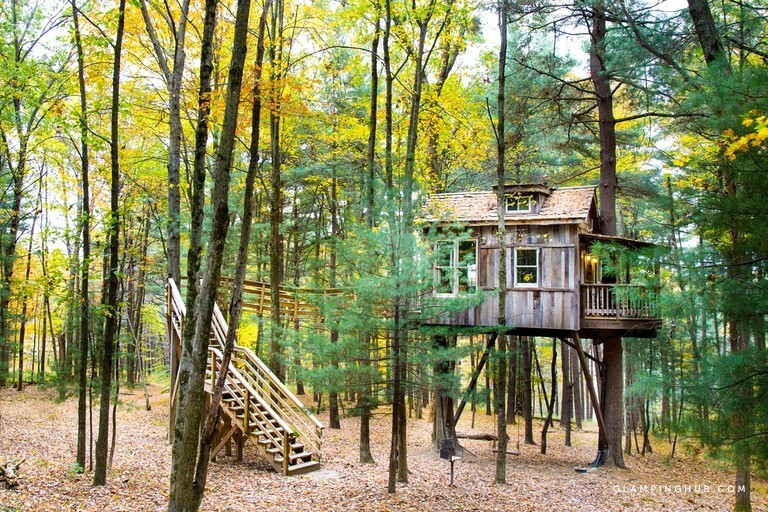 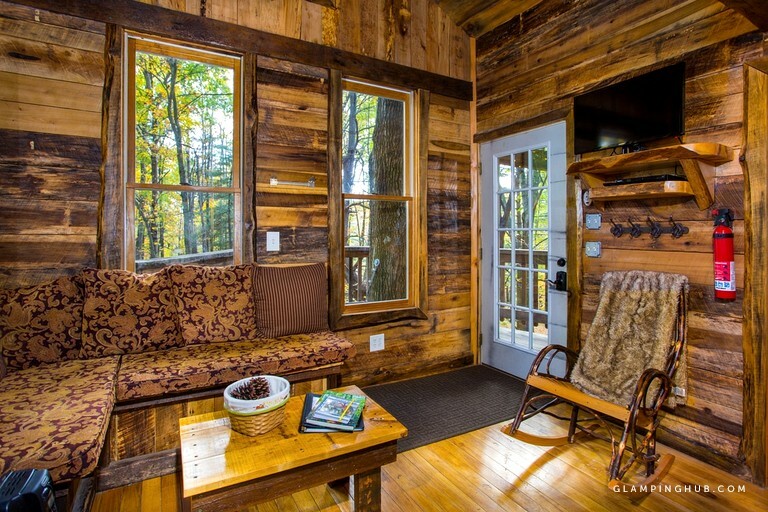 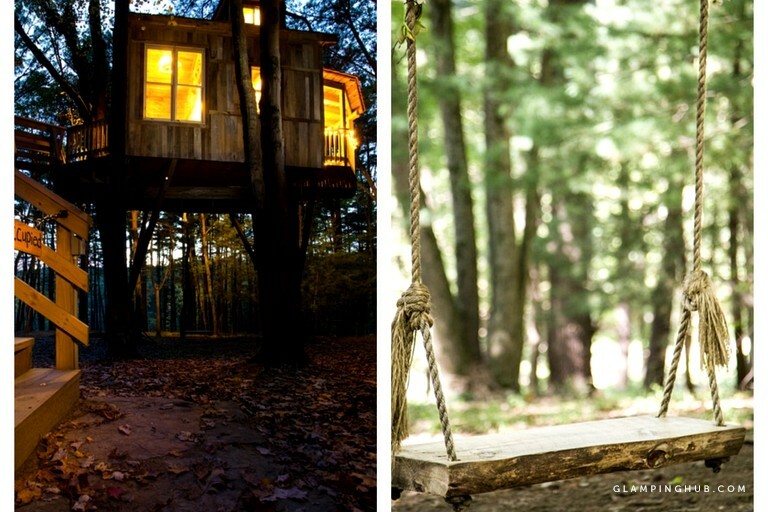 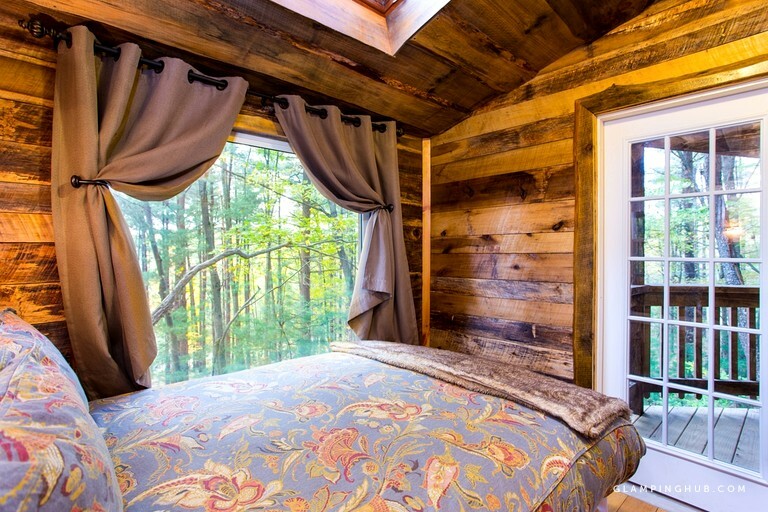 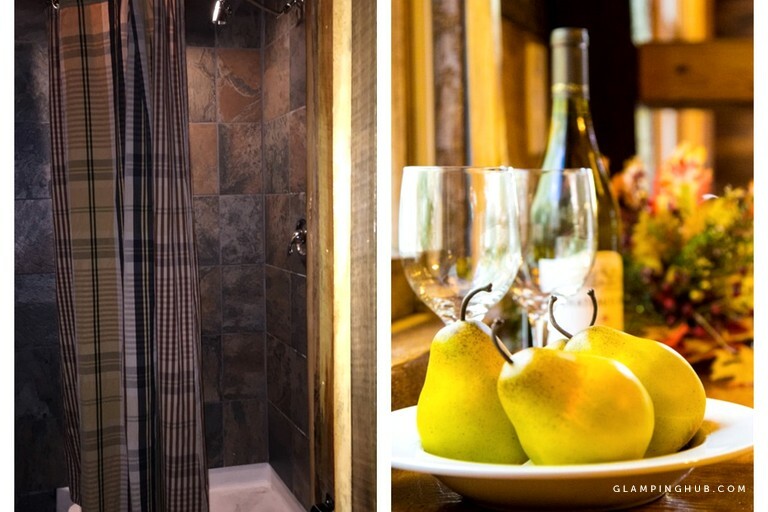 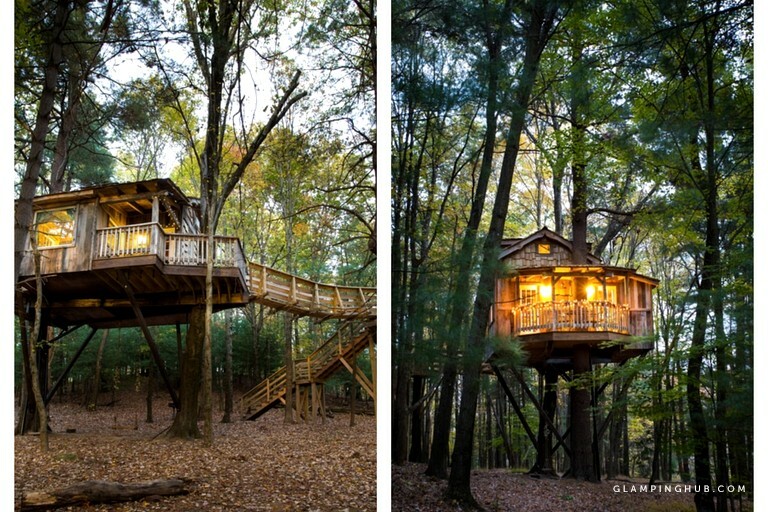 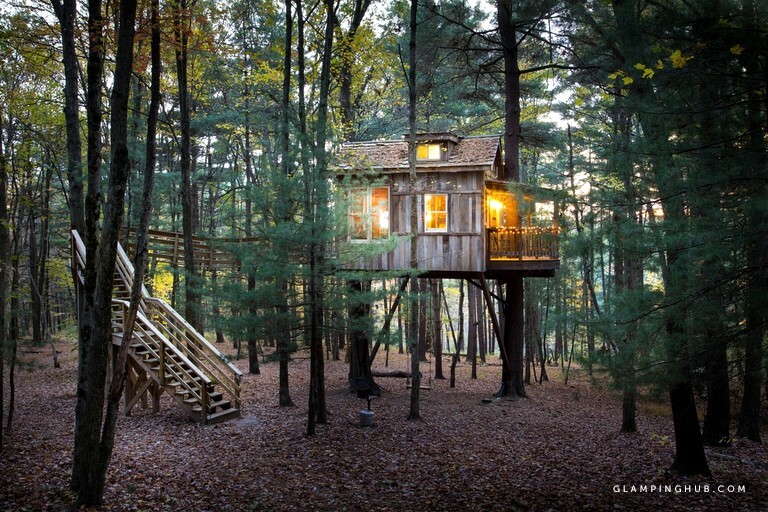 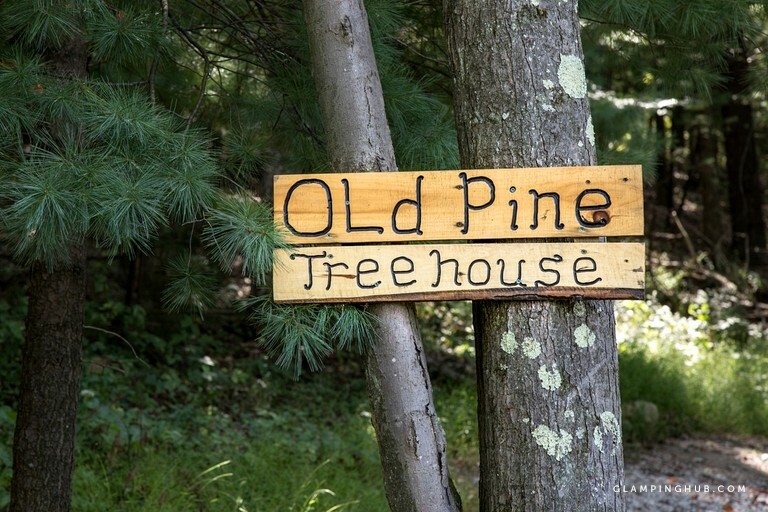 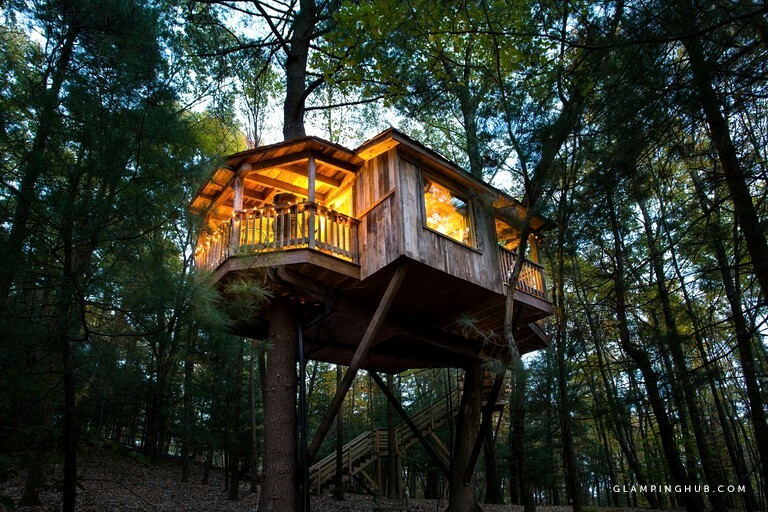 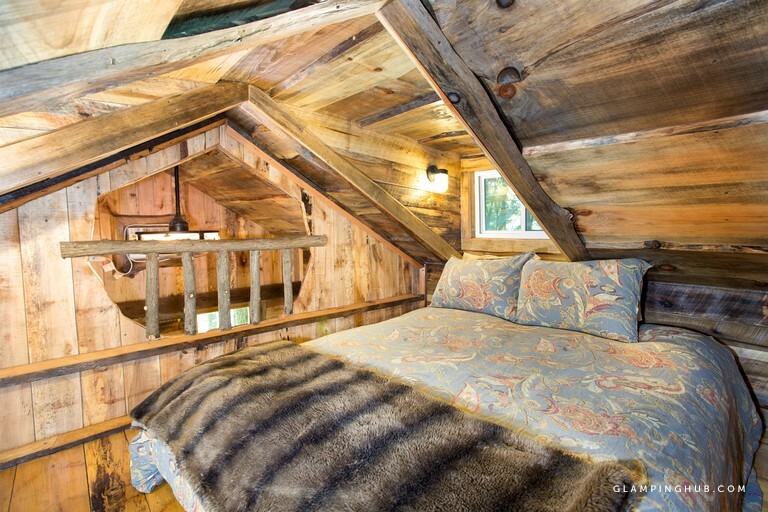 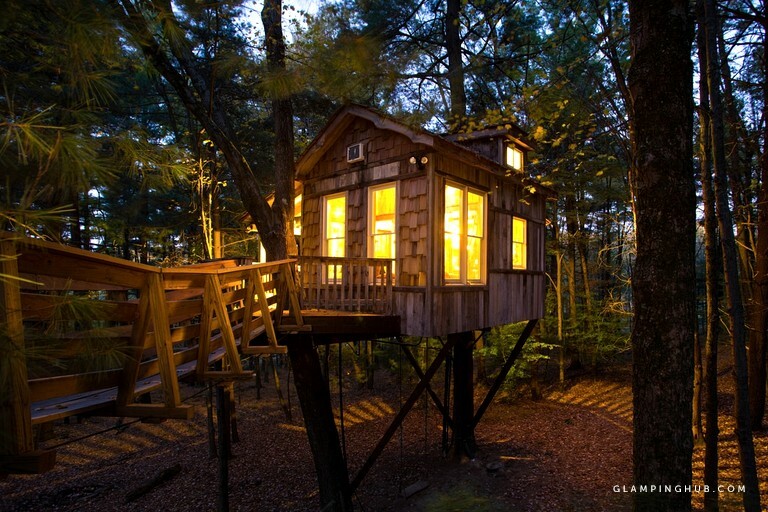 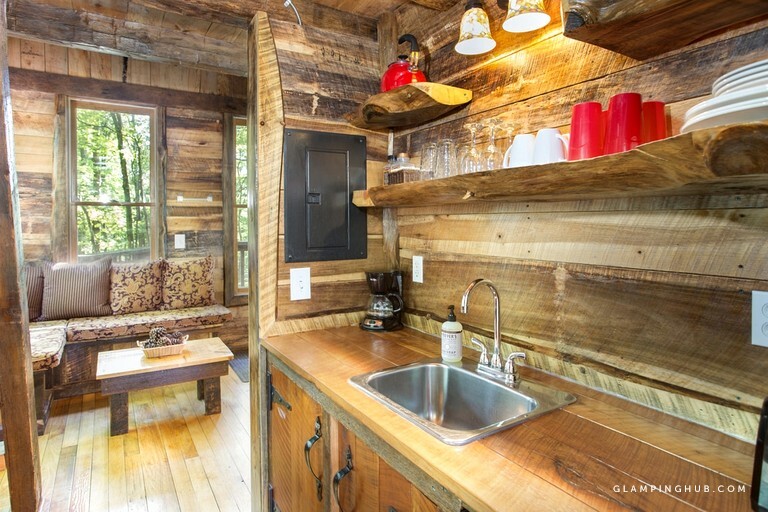 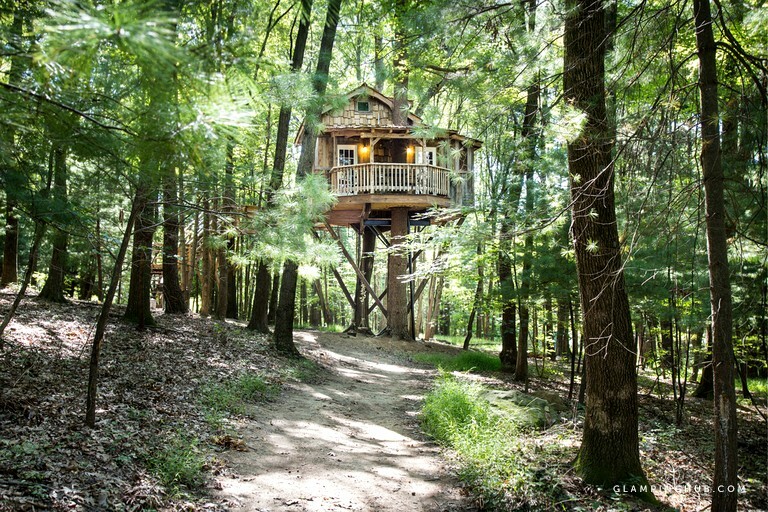 This Ohio tree house is custom designed and nestled among the property’s pine trees and can accommodate four guests. 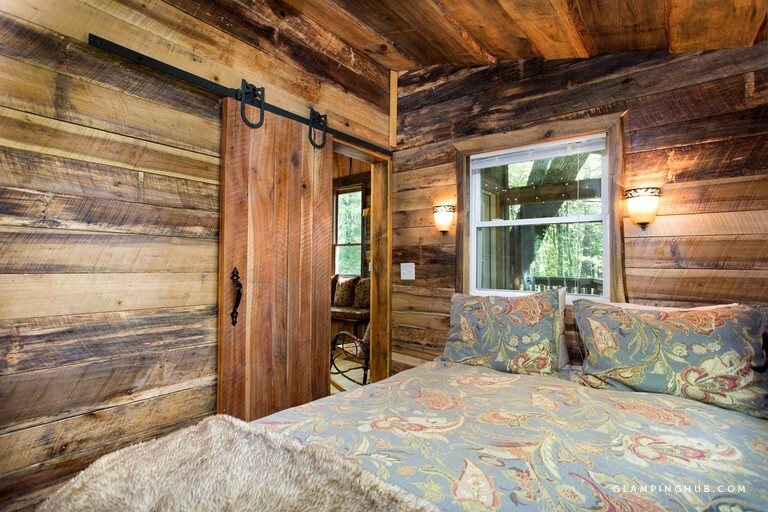 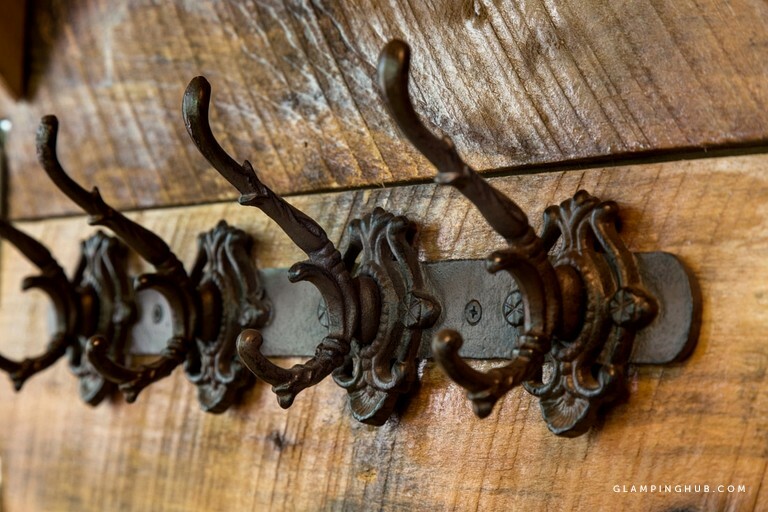 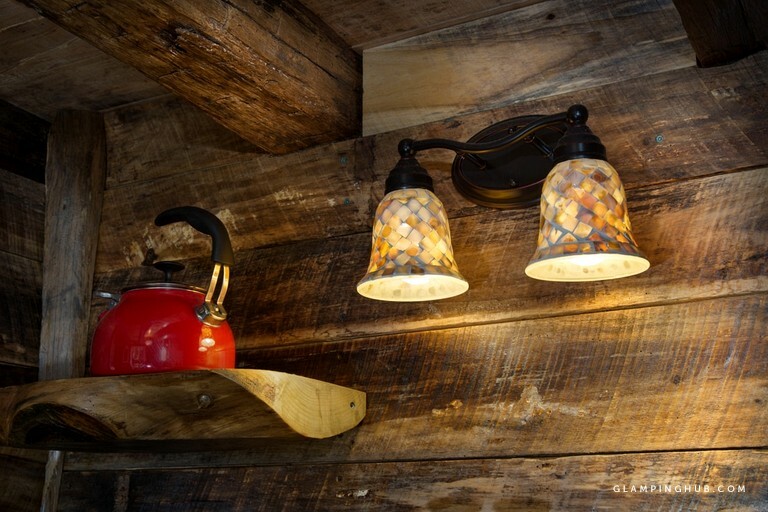 It was built with 100% reclaimed materials, including beautiful 100-year-old barn siding. 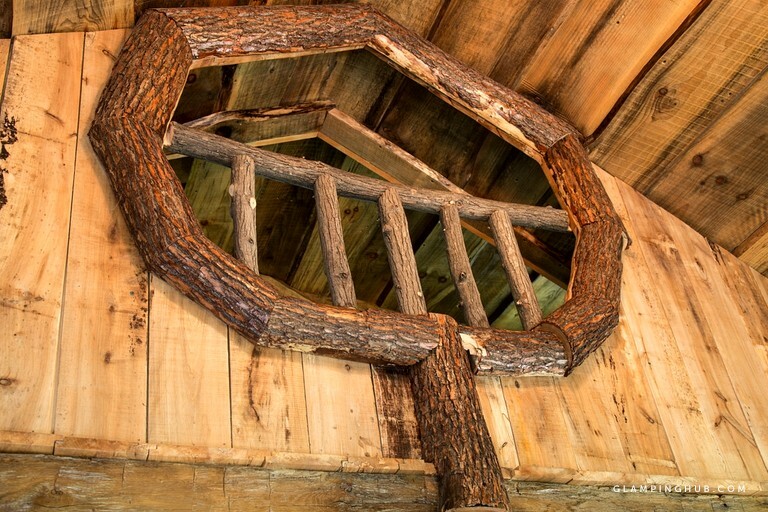 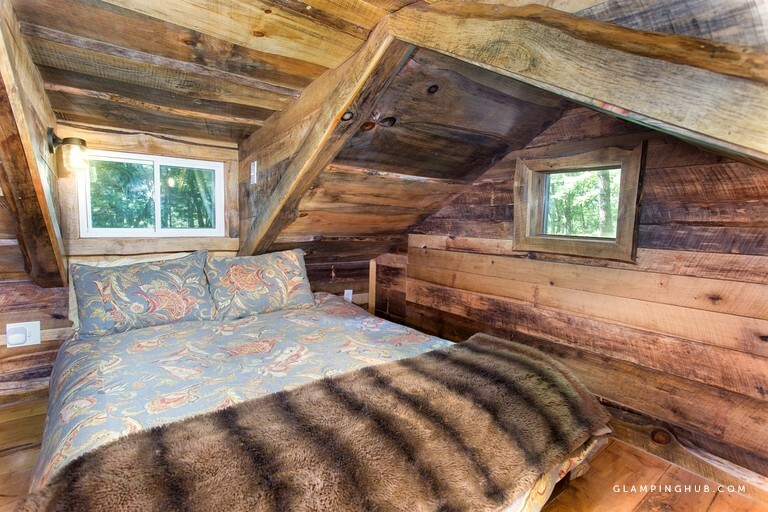 The cedar shake roofing of the tree house creates a very antique 1800s feel. 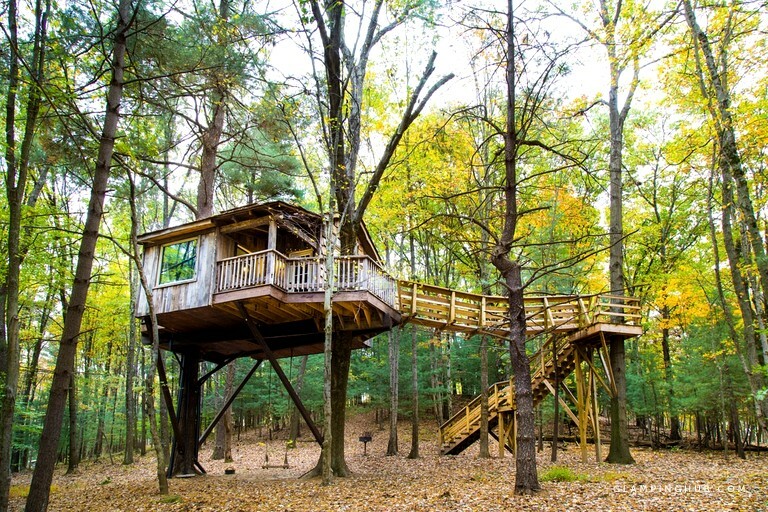 To access the tree house, glampers need to climb the staircase and walk across the suspension bridge. 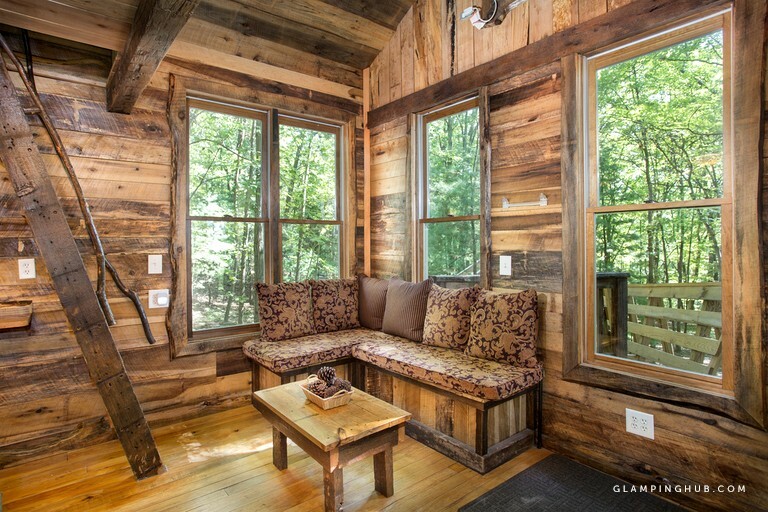 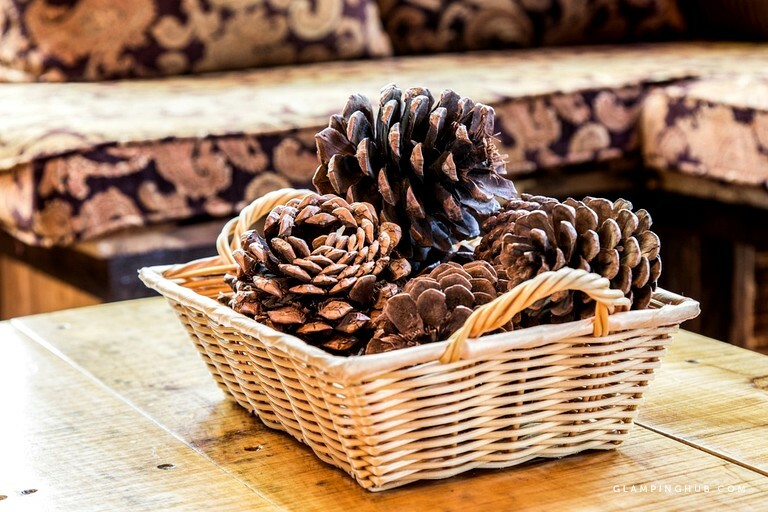 The tree house is equipped with indoor deluxe bathroom, a shower, a living room, a small kitchenette, a first-floor bedroom with a queen-size bed, a loft with a queen-size bed, a small eating area, and an outdoor shower during warm weather. 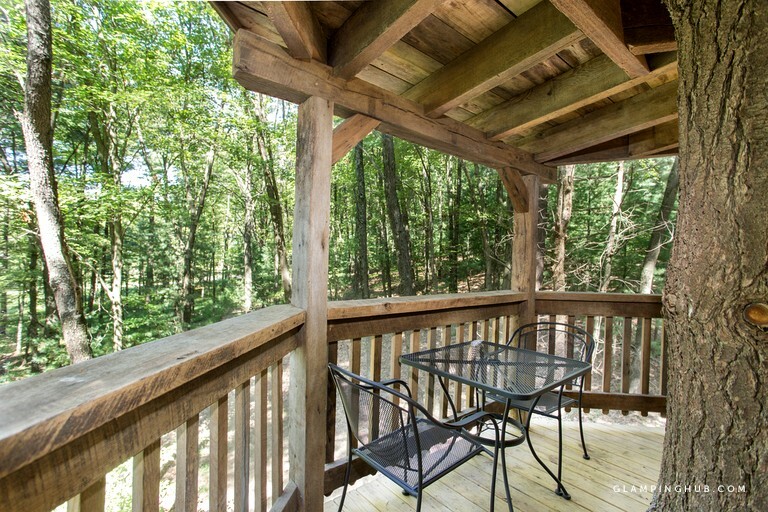 There is also a wrap-around porch, which is a great place to take in the surroundings. 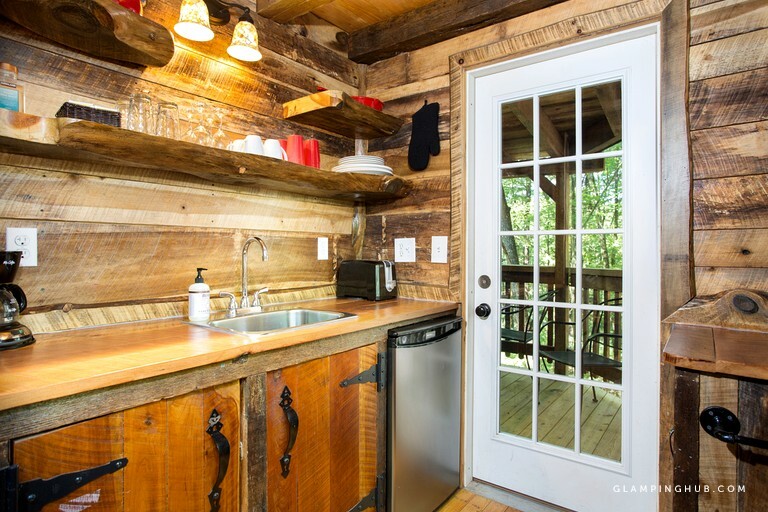 The fully stocked kitchen comes with a mini refrigerator, a small freezer, a microwave oven, a coffee maker, two electric burners, and complimentary coffee and filters. 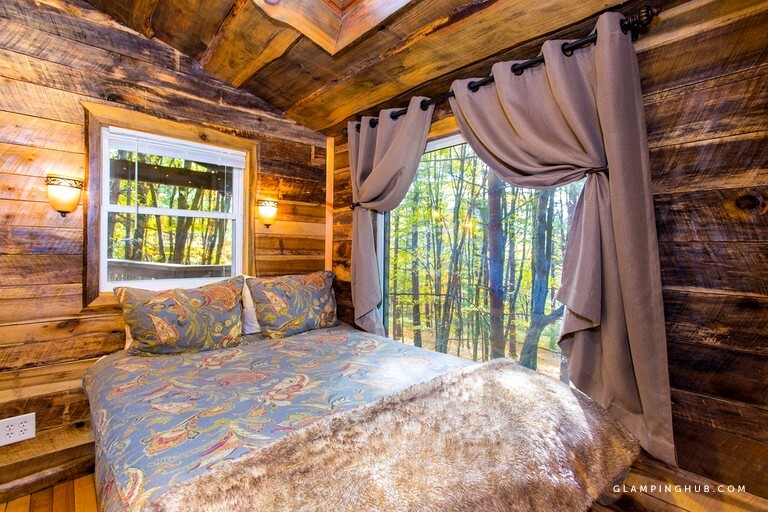 There is a sectional sofa, a TV, a DVD player, and a rocker in the living room. 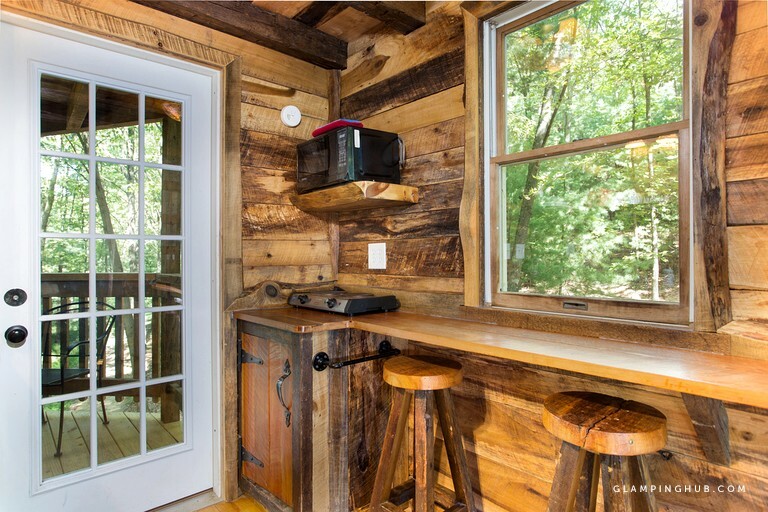 There is no satellite or cable, so remember to bring along some DVDs. 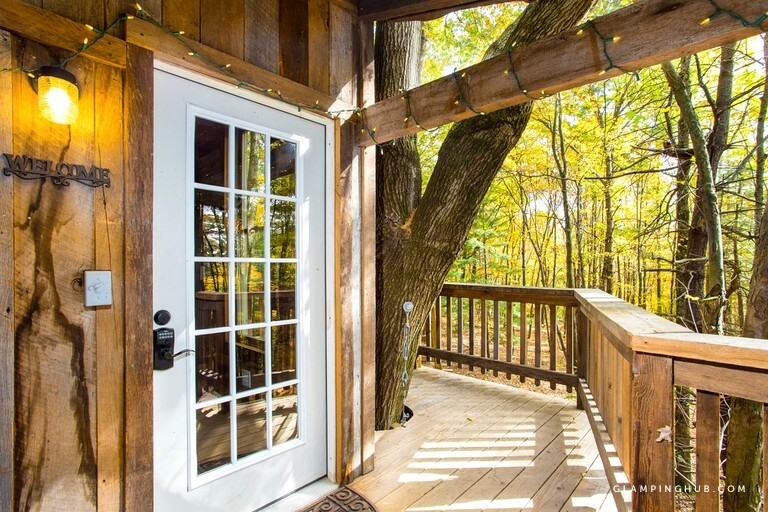 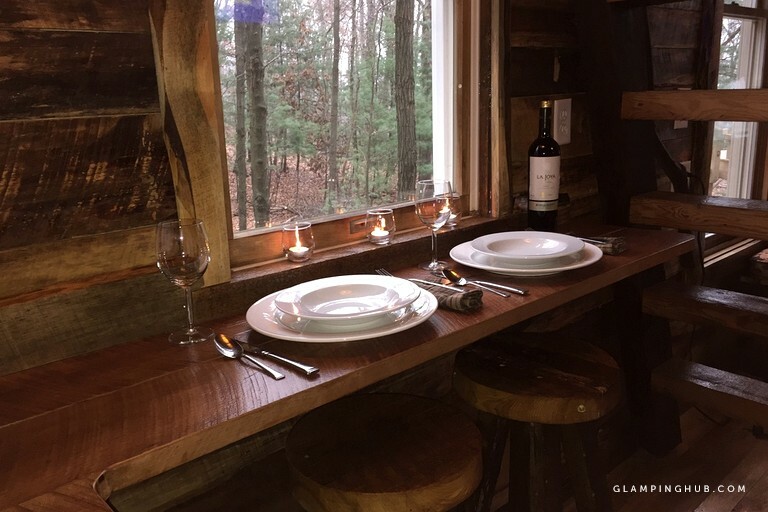 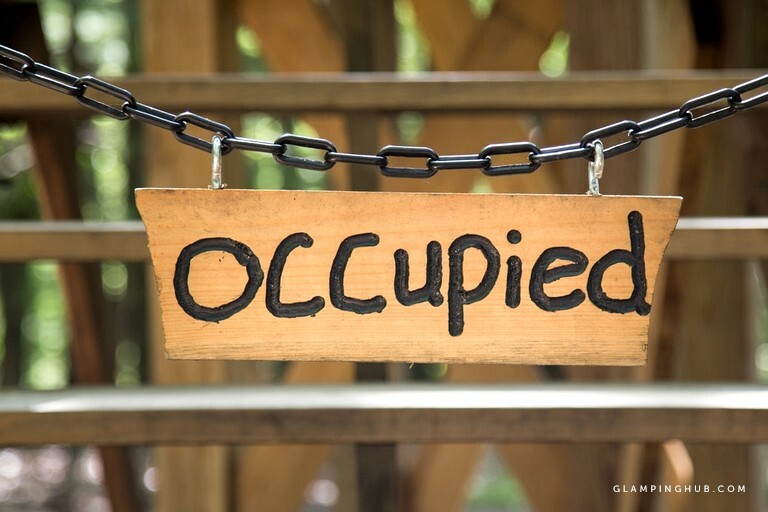 Glampers will love the unique design features found inside this tree house, including a sliding bedroom barn door, the loft overlooking the living area, private decks constructed around trees, and large windows to enjoy the views. 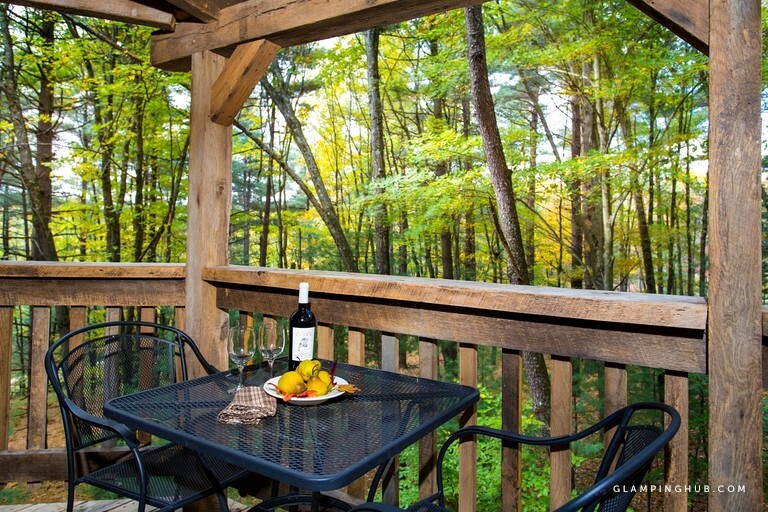 There is a charcoal grill on the ground level for guests to use. 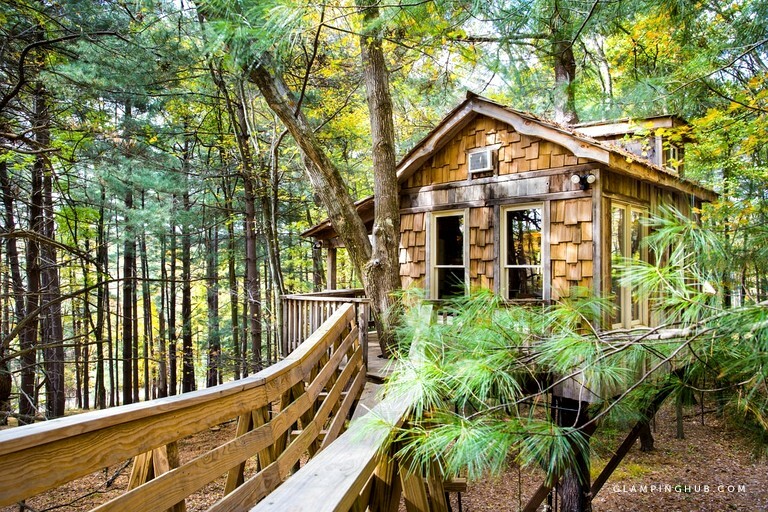 This tree house is fully heated, and it is also equipped with air conditioning for the hotter months.